How Do Dinosaurs Say Good Night? - Audiobook | Listen Instantly! 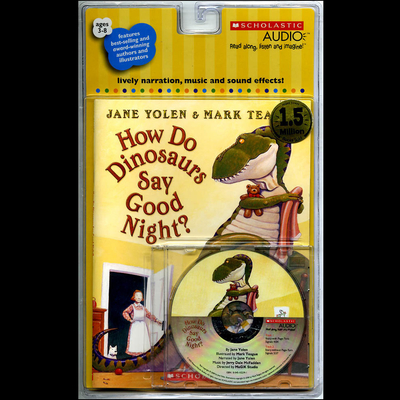 Audiobooks > Juvenile Fiction > Humorous Stories > How Do Dinosaurs Say Good Night? Internationally acclaimed author Jane Yolen composes a playful bedtime book about young dinosaurs. In a few simple lines of verse on each spread, fathers and mothers are ready to put their youngsters to bed. But in this book, the youngsters are a wide variety of dinosaurs. And how do dinosaurs say good night?
" A good book for kindergarten students because it introduces the different types of dinosaurs and relates them to the student's home life. A very funny and cute book. " " An excellent book for aunties to read to nephews! " " I love all of the books in this series, I think they give positive messages to children on how they should be acting through the actions of the dinosaurs. Children love dinosaurs, so it works! " " This is very charming for a children's story book with it's with bright color pictures, and the rhymes helps keep my young nieces interested in the story! I think Jane Yolen did a great job not making the story dull or boring to read because the story is interesting, short, fast-paced, and cute! I highly recommend this book to parents of children for a bedtime story! " " Witty, funny, and loving "
" Great series. Lots of fun and the kids love them. " " This is a cute little book about dinosaurs getting ready for bed. The dinosaur does a number of things like stump his feet and shake his head before with a hug and goodnight kiss he finally crawls under the covers and goes to sleep. This book is perfect with younger students to help them make text to self and text to text connections. " " Sometimes I think that I love this book even more than my son. We have fun acting out how the dinosaurs act and what they could do differently. " " I love this author...I love childrens books in general! Scholastic also has these stories in little cartoons! My kids love them! " " girls wanted this one twice. dinosaurs show all the behaviors NOT to show at bedtime and then do the proper ones. great pictures of dinosaurs doing amusing things like sitting in a people size bed and turning off the light switch with their tail. " " All of the How Do Dinosaurs... books are funny and lovable for little ones. " " What I really enjoyed about this book wasn't so much the story (which is fun, though nothing indepth) but the fact that each illustration has a dinosaur labeled with its saurian name! I think this is a great way to introduce children to the various types of dinos and familiarize them with their fantastic names. " " I have two "dinosaurs" myself. " " I love this book! It is my favorite to read to the kids at night. What is better then a great big DINOSAUR KISS??!!! " " Grandma got this for our little "dinosaur," and it's a big hit with everyone. Especially Mommy, who was getting a little weary of bedtime drama. Ayy. " " Do kids act like dinosaurs right before bedtime or do dinosaurs act like kids? A great bedtime read for my son. " " It is a hilarious book that my son really enjoys reading. " " Most definitely a memorable book. It had good illustrations and was FUNNY! I imagine a soundscape activity to be fun here if just because of the many dinosaur sounds there are. " " Logan saw scary dinos on tv and these guys are very friendly so we read this A LOT. " " Discovered this one at Grace and Tyler's. A cute twist on dinosaur-mania. " " The kids and I spend a lot of time looking at the pictures and all the little details that makes the dinosaurs "kids". They all really enjoy this book. " " This is a great bedtime story. I have read it to my baby nephew and clients with severe disabilities. It is engaging and calming. " " A study in manners. Dinosaurs (who inexplicably have human parents) demonstrate poor bedtime behavior, followed by proper bedtime behavior. A hit as a kindergarten read-aloud. Additional fun is provided by the dinosaurs' names hidden in each picture. " " A cute book that my little ones enjoyed. " " This book is good for comparison/contrast to how the student or younger child would say goodnight, as well as a good sequencing activity describing what happens, first, next, last, etc. " " Favorite How Do Dinosaurs ... book yet. " " Did this for 2-3 y.o. storytime and the more mature kids liked it. This might be a new favorite for PJ storytime. " " A great set of books. " " This was a favorite when my son was 4 or 5 yrs old. Now 6, we still re-read it before bed now and then. It's a sweet little book with very good illustrations guiding children to proper bedtime behaviour. It's cute, it's funny. It'll do! " " The illustrations of dinosaurs being naughty crushed into domestic scenes is wonderful and laugh out loud funny. Good behavior is discussed and shown but it is the bad behavior shown first that will make both adults and kids laugh. " " Great for little ones "
" A loved it right off the bat. We read it almost everyday for the 6 weeks we had it with us. " " Superb illustrations. Cute rhyms that teach good manners - a very cute set. Equally enjoyable in Spanish. " " A book about how dinosaurs get ready for bed. The names of the dinosaurs are on every page,too. This funny book will keep students entertained the whole time. You could also discuss how each student gets ready for bed. " " Gabby's 1st favorite book -- read over 100 times! " " funny, funny book i loved it I read it most of the time "
" My son really enjoyed reading this one to me. His school sent it home in the dinosaur literacy bag. " " Natalie LOVED this book. I really liked how they made the dinosaurs look like they had human emotions. Very cute. But sadly it had to go back to the library :( "
" One of my son's favorite books. " " This is a perfect bedtime story. The illustrations are full of character and kept a grin on my face for the duration. " " Adorable! I hope to read this to my kids one day! It also teaches young children the art of rhyming! " " My daughter could learn a thing or two from these prehistoric tykes. " " As with the other books in the series, short engaging text, very fast paced, awesome illustrations. " " This is a very sweet story that is fun to read aloud at bedtime. It rhymes nicely and the message brings a smile to both our faces. I checked it out from the library but I think I might have to buy it, which is a big compliment from me. " " We like the real names of the dinosaurs labeling the illustrators. " " Sooo cute and fun, but not insipid. " " Aw, look! He's holding a little teddy bear! That is so hard not to love! A little tale of what to do and not do when getting ready for bed. " " When I first read this to my child years back it struck me as accessible to the young listener and amusing to the adult reader, which is essential to me as a reading parent. In addition, the use of words and images is funny, craftsmanlike, and, well, magical. " " Very interesting for young children ... I read it to my niece who is 9 months old many times, and every time she stares at the pictures and tries to catch the parents :D "
" Another fun dinosaur book. I liked the rhyming, and the art and pictures of dinosaurs being sulky are silly and a lot of fun. My favorite line from a preschooler at the end of this book--"The bed's too small for the dinosaur!" They really seemed to enjoy the book; would read it again! " " Every time we go to the library, we have to check out this book. I think I need to buy it for her. She just loves it "
" This bedtime book was well received by kids and parents alike. A great read to a group.
" cute way to start a bedtime routine. " " Great book to read before going to bed if you are a kid! " " This is so much fun and the illustrations are superb. Has a 1950's feel to me. Love the rest of the books in the series too. If your kids love dinosaurs, this is a winner. " " Millie read this to me and she rated it a 3, so there ya go. " " Haven't read a "How do Dinosaurs" book I haven't liked. " " Fun about dinosaurs. Great for the start of a lesson on dinosaurs and or routines. A good suggestion that I read is to have the students go through the book and identify as many dinosaurs as possible. " " These are such great reads! They are easy and introduce children into the world of dinosaurs. This creative and clever way to cast dinosaurs into human life is why I love these books. I would also like my students to create their own animal series. " " A nice short story of getting dinosaurs to go to bed. Rhyming story with mostly basic words that would be great for letting beginning readers dive into with little assistance. Also great for students who love dinosaurs! " " A snack-time selection at school. Danny loves dinosaurs, so he loved it. Mom wasn't too happy with the bad behaviors modeled in it. " " This book can be good for developing readers to read the words in large font and learn vocabulary. I find this story amusing since the dinosaurs act like most children do when they hear it's time to sleep. The book has great illustrations, but it is not written in a story format. " " This is a great book with rhyming words through out the story. It would also make a good bedtime story. I had numerous students who just LOVED dinosaurs and I think they will really like this book. It even has list of different dinosaurs. I would recommend this books to pre-k to kindergartners. " " A favorite around here. What little boy doesn't like dinosaurs (and throwing tantrums at that!) and verse? " " The only problem is that all the dinos in the story are boys, so I switch some to "she" when I read it. Otherwise, great book! " " All children can relate to their bedtime routine. So I think this books illustrates in a positive way what not to do and what to do when going to bed. There is a different kind of dinosaur on each page which makes it interesting as well. I would like to own this one someday. " " This is such a fun book to read to my little Dinosaur Fanatic! The art is great too, with the names of the dinosaurs "hidden" on each page. " Jane Yolen has been called the Hans Christian Andersen of America and the Aesop of the twentieth century. She has written over three hundred books, including Owl Moon and The Devil’s Arithmetic. She splits her time between Massachusetts and Scotland.